A powerhouse bowl of food. Cook the quinoa beforehand. Even better, next time you cook quinoa place it in a freezer safe container and freeze until the next time you want quinoa. In a big mixing bowl, mash the avocado and squeeze in the lime juice. Add a pinch or two of salt and mix well. Take the kale leaves off the stalk. Dice the green apple and thinly slice the scallion. Toast the pumpkin seeds in a skillet on the stovetop over a medium flame. They are ready when they start popping but watch so they don’t burn. Place the kale into the avocado dressing mixture. 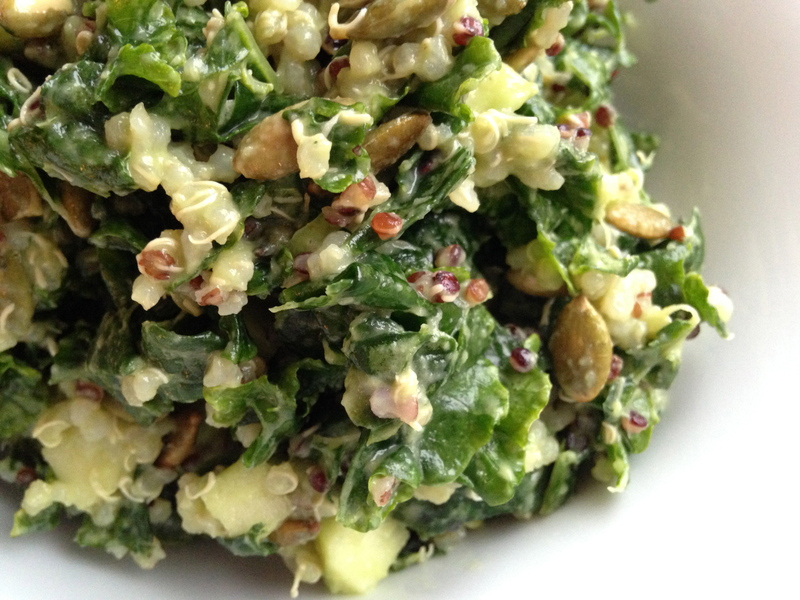 Start working the dressing into the kale – massaging it – until it softens. Add the quinoa, apples, scallions and pumpkin seeds. Mix well. Serve and enjoy!